The Mitsubishi Outlander Sport compact SUV is a smaller and better-looking version of the Outlander. It’s capable, and it costs less than its more stylish rivals, but it’s hard to favorably compare it after that. Its formidable competition includes the Mazda CX-5, Kia Sportage, Honda CR-V, Ford Escape, Jeep Compass, Chevy Trax, and Hyundai Tucson, having better powertrains, cabins, handling, and fuel mileage. That said, Mitsubishi is one of the most experienced carmakers in the world when it comes to all-wheel drive. The Outlander Sport system is called AWC, for all-wheel control, and is proven and sophisticated. Also, the five-year, 60,000-mile comprehensive warranty is very good. Changes for 2018 included a revised grille and rear fascia, new center console, shift lever and USB ports, and a 7″ touchscreen with Bluetooth and audio streaming. The two upper models, SE and SEL, get LED running lamps, Apple CarPlay and Android Auto, and a new CVT transmission with the 2.4-liter engine. On the top SEL model, there is a new Touring Package with advanced safety technologies including Forward Collision Mitigation, Lane Departure Warning, and Automatic High Beam system. There is also a Rockford Fosgate premium audio system and panoramic roof. Outlander Sport comes with a 2.0-liter or 2.4-liter four-cylinder engine, with standard front-wheel drive or available all-wheel drive. The smaller engine is slow and doesn’t get much better fuel mileage than the 2.4 liter. It makes 148 horsepower mated to either a 5-speed manual transmission or continuously variable transmission (CVT). The 2.4-liter engine makes 168 horsepower, same as the least powerful Ford Escape, and comes only with the CVT, a new generation design for 2018. With all-wheel drive, it gets an EPA-estimated 22 miles per gallon City, 27 Highway, and 24 Combined. With front-wheel drive, it gets one more mpg. The front-wheel-drive model with the 2.0 engine gets 24/30/27 mpg. In crashworthiness safety, the NHTSA gives it four stars overall, with four stars for frontal and rollover crash testing. The IIHS gives it mostly Good scores except for the difficult small-overlap front crash test, where it’s Acceptable. 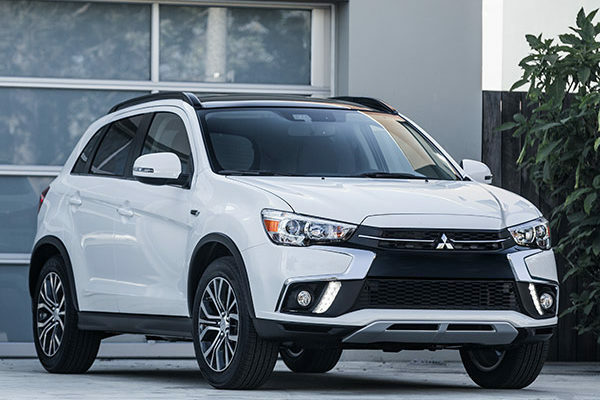 Outlander Sport ES ($20,295) comes with the 2.0-liter engine, manual transmission, front-wheel drive, fabric upholstery (upgraded in 2017), automatic climate controls, Bluetooth, 18-inch wheels. Add $1200 for the CVT. (Prices are MSRP and do not include destination charge.) LE adds more equipment. Outlander Sport SE ($22,895) and SEL ($24,395) use the 2.4-liter engine with new CVT. All-wheel drive on the SE and SEL is $1500, but with the smaller engine on the ES and LE it’s a whopping $2700 more. Outlander Sport SE adds fog lights, heated front seats, a 6.1-inch touchscreen, upgraded stereo system, rearview camera, and keyless ignition. SEL adds automatic headlights, power adjustable driver’s seat, leather seats, rain-sensing wipers, chrome exterior accents, and paddle shifters for its CVT. Outlander Sport’s profile is fairly handsome, like a tall wagon. It avoids slab sides with a rising character line that reaches from the front wheel arch to the back of the rear doors. From some angles, it looks sporty; from others, a little bulbous. The standard 18-inch wheels add presence. The front end widens the grille and lower air intake with body-colored panels on the bumper that spread from the center, dividing dark inlets. There’s some chrome thrown in the mix at the fascia, a faux skidplate at the bottom, and round foglamps. LED running laps live in the headlamp units that sweep back from the corners of the fenders. So there’s a lot to look at. The sheetmetal holds its own, but the interior loses. It’s flat, black, and uninteresting. The instrument panel lacks styling (some would call that blessedly simple) and the buttons have a budget feel.. Materials of a lower quality than rivals show why it costs less. The seats are fairly flat, also inferior to rivals. It’s better with cargo, having a low loading floor and more than 20 cubic feet behind the rear seat. With the 60/40 rear seats folded, it holds 50 cubic feet; that’s impressive considering it’s actually a bit smaller on the outside than some rivals. And a pass-through in the rear seat can fit skis or two-by-fours, while still allowing two passengers. Rearward visibility is generally good despite thick rear roof pillars. Performance is underwhelming. The 2.0-liter engine, with 148 horsepower and 145 pound-feet of torque, with the 5-speed manual or CVT, is loud and slow. It can’t keep up with traffic, around town or on the freeway, and especially on long mountain grades. The 2.4 liter that makes 168 hp and 168 lb-ft isn’t quick either. However, the Outlander Sport handles well for a crossover its size. The body is well controlled, and the electric power steering is dialed in. Mitsubishi Outlander Sport is primarily a price decision. It trails the class in powertrain, cabin, details, and fuel mileage. The two four-cylinder engines are proven but both slow. The looks, handling, and warranty are good.